If you have experience with legacy CFD codes, and have ended up stuck with the task of grid generation, you probably have a laundry list of case setup grievances. I’ll tell you my list: a wide range of length scales, moving geometries, internal corners, cusped edge interfaces, and long-duration simulations. There are many fluid flows that are fundamentally so complicated I wouldn’t even consider them suitable for analysis with CFD. You can imagine why I was so astonished when I saw Daniel Lee’s automotive paint bake oven simulation. 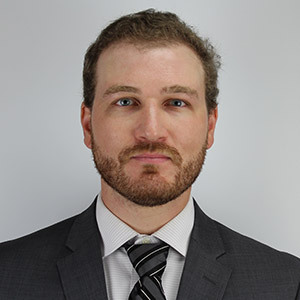 Dr. Lee is a co-owner and vice president at Convergent Science, and he’s constantly pushing the envelope with innovative CFD simulations. 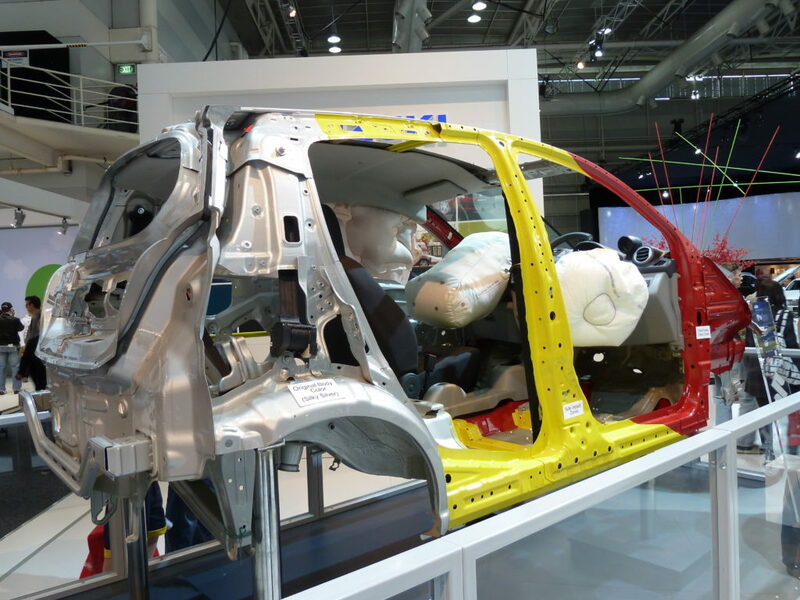 Imagine you operate a car factory, and you have assembled the structural skeleton of a vehicle. You’ve run that unibody through the paint spray booth, and you have a wet body in white (BiW). What’s next? For paint that must last decades in the worst Mother Nature can offer, it has to cure under carefully controlled conditions, dust-free, at the optimal temperature and humidity. You need a paint bake oven. In an assembly line paint bake oven, the BiW passes slowly through a large array of hot air jets, and may also be heated by radiative elements. The goal is simple: steady, consistent conditions across the entire painted surface. Achieving that goal is anything but simple. Nooks and crannies will be relatively isolated from the air flow, and might be shielded from the radiative heaters. Small surface features must have a coating just as durable as a wide expanse of sheet metal–as any Midwesterner knows, a tiny paint defect can turn into a patch of rust seemingly overnight. That makes for a challenging problem to analyze experimentally, because we care about pointwise effects instead of metrics integrated over an area or a volume. However, the computational challenges are just as daunting. Length scales? We have a domain some ten meters long, but the BiW has holes you couldn’t fit your finger through. The entire geometry is moving. Internal corners and cusped edges abound–it’s stamped steel! And the geometry moves through that ten-meter domain at a snail’s pace. It’s my worst nightmare as a computational fluid dynamicist–or it was until I was introduced to CONVERGE. Figure 2: BiW and oven geometry as seen in CONVERGE Studio. The small squares represent the array of oven jets. Of course, autonomous meshing is a time-saver for any flow more geometrically complex than turbulence in a box. This geometry, however, is essentially impossible to tackle without it. With the tools I used to use, you just couldn’t get there from here, not even with months of dedicated meshing time. And the numerical shortcomings of tetrahedra are well-known. 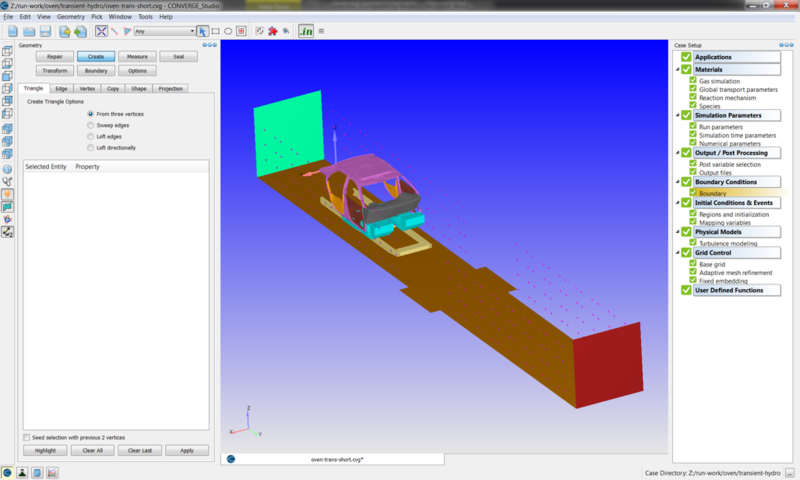 With CONVERGE, all we have to do is load the geometry in CONVERGE Studio, set up the physical models, and hit go. Those length scales, and those complex surface features? Embedding and adaptive mesh refinement (AMR) will handle it. Moving geometries are trivial. Long duration? Not a problem. When we couple a high-quality, feature-resolved and gradient-resolved mesh with an accurate transient solver and advanced physical models, we can predict the surface heat transfer over the entire BiW at all times. If we want to predict surface temperature, we can add in CONVERGE’s conjugate heat transfer modeling and super-cycling. What looked like a hopeless analysis task becomes routine. Figure 3: Iso-surface of velocity showing the oven jets impinging upon the BiW. 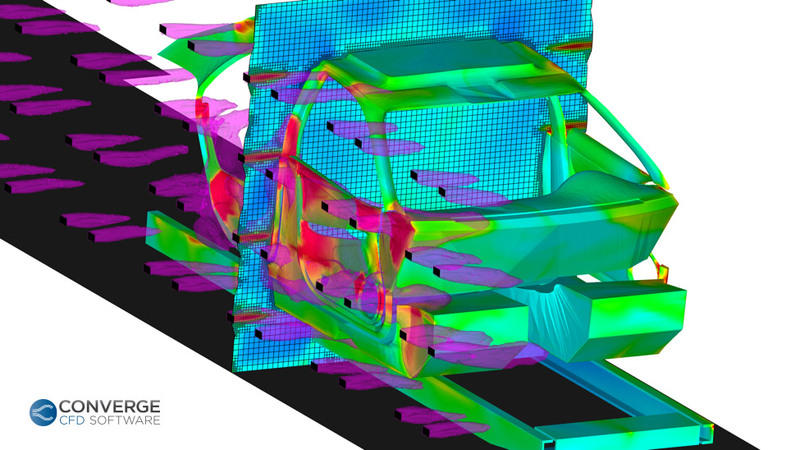 As CFD engineers, we’re trained to see deficiencies (and develop improvements) for the class of problems we’ve always run. CONVERGE opens up entirely new classes of problems, and lets us easily simulate flows that we never used to consider tractable.